Royal Caribbean have released a video infographic of their new giraffe art installation on Anthem of the Seas. 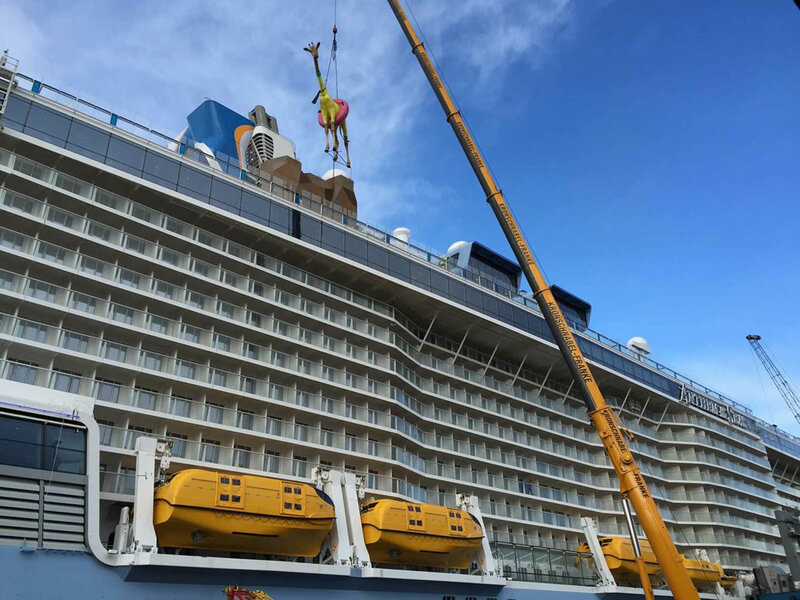 Affectionately named “Gigi the giraffe” by the crew of Anthem of the Seas this art installation weighs four tonnes and is ten metres in height. The artwork comprises of 15 carbon fibre pieces and is the brainchild of French artist Jean-François Fourtou, who is renowned for depicting animals outside of their natural context. In this instance Gigi has been crafted wearing a yellow swimsuit and a pink rubber ring. Gigi the giraffe was craned into position last week into her position on deck 15. Anthem of the Seas is due to arrive in Southampton in five days’ time.